Anyway, I've been loving Ikea's Lack and Ribba shelves for awhile and I am super excited about all of the places I can put them in our house. For sure I want to put a few in our living room and then a few in our kitchen. 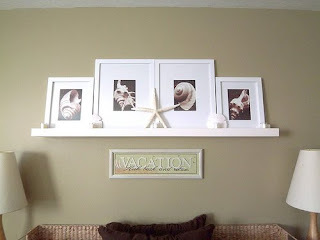 I think the Lack shelves are awesome for laundry room, offices or bedrooms as well. We have an open closet in our master bath so I might do some Lack shelves in there as well. #1 Console behind a couch: I seriously think that anyone who has a couch against the wall should have this. Unfortunately this is not us... because of our open floor plan our couch is kind of in the middle of our Living Room so it won't work but I do love it. This picture has also inspired me to spray paint every picture frame I have white. 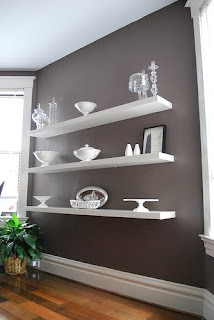 Here is the Ribba shelf which I also love. It is really narrow and just kind of acts as a ledge for pictures or really small things to display. LOVE LOVE LOVE it in white.